This is a weekly post by Nidhal Guessoum (see his earlier posts here). 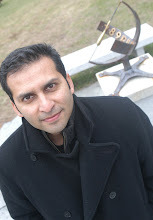 Nidhal is an astrophysicist and Professor of Physics at American University of Sharjah and is the author of Islam's Quantum Question: Reconciling Muslim Tradition and Modern Science. This is my first participation in an AAAS (American Association for the Advancement of Science) Meeting, and I have found it just great. It is indeed one of those huge conferences, requiring all the space in a convention center like Washington’s, where dozens of parallel sessions can be held, in addition to large halls for the big plenary lectures, a huge exhibition area where the booths of many associations, organizations, publishers, etc. can be set up. The size of the conference itself did not bother me too much. I have taken part in similarly large conferences before (e.g. the COSPAR Conference on Space and Astrophysics in Bremen, Germany, last summer – see here). It is indeed a bit daunting to have to carefully read through the thick program, highlight the sessions of interest, and then construct a schedule making one go from one room to another all day, while still leaving some room for chats with friends and colleagues (I had not seen Salman since our first meeting in Alexandria, Egypt, in November 2009), visits to the exhibition hall, etc. What I found most interesting in the AAAS Meeting is the fact that the various sessions, lectures, and panel discussions cover a wide range of topics and levels of presentations, from the very technical (but nicely presented by the speakers) to the cultural and policy-related issues. For example, one lecture was interestingly titled “Is lecture a dirty word?” (unfortunately I could not go to that one); on the historical aspects, Lawrence Principe gave a lecture on Alchemy (Salman went to that one, he might comment on it); I may also mention the interesting panel on “Evangelicals, Science, and Policy: Toward a Constructive Engagement”; on the policy front, I should refer to John P. Holdren, the assistant to the President for Science and Technology, director of the White House Office of Science and Technology Policy (OSTP), and co-chair of the President's Council of Advisors on Science and Technology, who gave a plenary lecture titled “Policy for Science, Technology, and Innovation in the Obama Administration: a mid-course update” (didn’t get to listen to this one either). So which sessions did I go to if I missed that many interesting ones? Barely an hour or two after my arrival in DC, I ran to the Convention Center to make it just in time for the “Challenge of Teaching Evolution in the Islamic World” session where Salman was to speak, alongside Taner Edis and Jason Wiles. Edis gave a short historical review of Turkish creationism; Wiles reported on the recent study of attitudes toward Evolution among Muslim students and teachers in several countries (Indonesia, Pakistan, Egypt, Lebanon) plus the Muslim-Canadian community; Hameed gave a preliminary report on his current research project where he explores the views and attitudes of Muslim physicians and medical students in several Muslim countries. The highlight of the session (OK, I’m a bit biased here) was the comparison of the responses that Salman and his collaborators have gotten in Pakistan and in Malaysia; I will not divulge anything; Salman may say more sometime, or we may have to wait for the paper(s) he is preparing for the latter part of 2011. What struck me in that session was the high level of interest on the part of the audience. First, it was well attended, somewhere between 50 and 100 were there, quite a feat in a conference where there are dozens of sessions to choose from at any moment. Secondly, after each of the short talks, there were many hands raised for questions, oftentimes bringing up interesting points or asking about parallels or contrasts between the attitudes in the Muslim world and in the West (among Muslim communities or the general population of, say, the United States). And at the end of the session, I saw many people, including reporters, rush to the stage to talk to Salman and his co-panelists. Ah yes, indeed, one of the characteristic features of the AAAS Meeting(s) is the huge presence of the science press corps. Indeed, this is a conference where scientists are simultaneously addressing their peers and the media. Handouts are made available at the back of the room in most sessions; a large press room is available for interviews and the filing of reports, and reporters regularly select the speakers they want to get clarifications from for potential news stories. The badge colors make it easy to identify the media people, along with their affiliations; I saw reporters from many countries (e.g. Korea) as well as freelancers. Now, I think I can objectively say that the theme with the largest attraction at the Meeting, both in terms of the sessions devoted to it (number of speakers, total time, etc.) and the level of attendance, was the discovery of other planets and the search for life out there. I am not saying that because my session was devoted to the “cultural” implications of such discoveries (in fact, as I write, early Sunday morning in my hotel room, my sleep pattern having been wrecked by jet-lag), that session has not yet taken place. It promises to be highly interesting, but I’ll let Salman comment on it later. I will come back and discuss the whole theme of exoplanets and search for life in another post in a few days, particularly with the stunning reports from the Kepler team (I won’t say “revolution”; we’ve used that word more than enough lately). The last item I would like to mention is the special 90-minute session that was devoted to one long presentation and an extended Q&A session about the Kuwait Institute for Scientific Research (KISR), titled Significant Partnership Opportunities. Naji Al-Mutairi, an official from KISR, gave a nice presentation about the research capabilities of this 40-year-old institution, highlighting its various fields of interest, which included biotechnology, fishery and agriculture, energy conservation and environment, and seismic activity. Al-Mutairi emphasized KISR’s current and future will to move to an “international partnership” phase, to share expertise and address research problems of mutual interest with other institutions. A few facts give an idea of the seriousness of that will: the operating budget of KISR has more than tripled in the last 3 years, reaching $200 million now; the budget allocated for the “global partnership” research program is $960 million, not counting $55 million for “exchange programs”; the total number of staff at KISR is 1,300, almost a quarter of whom are expats. Indeed, one of the objectives of the session was to entice both senior and young, talented researchers to apply for positions and propose projects. For more information, the website for the institute can be found here, although the “current vacancies” page says “For Kuwaitis only” right at the top; I guess one would have to contact the officials and refer to their pitch at the AAAS Meeting.